Former NBA legend Dennis Rodman will return to North Korea soon with a “promise” to gain the release of jailed American proselytizer Kenneth Bae, as Pyongyang abruptly cancelled Friday an invitation to a senior State Dept. official who, according to U.S. officials, had already hammered out an agreement that would have seen the prisoner return with the most senior U.S. official to visit the isolated nation since Kim Jong Un assumed power in December 2011. Three days ago, on August 27, the U.S. State Department announced that Special Envoy for North Korean Human Rights Robert King would travel to North Korea to bring home an American Christian missionary doing hard labor in prison for proselytizing Christianity. What several senior U.S officials involved in the negotiations to release the U.S. prisoner didn’t know, was flamboyant former basketball star Dennis Rodman, is scheduled to arrive in Pyongyang in a few days at the invitation of “my friend” Kim Jong Un with a stated mission to bring about the release of Kenneth Bae. Now, instead of Ambassador King, it appears that the tatood, heavily pierced ‘bad boy’ Rodman will likely be the point man for the release of Bae. 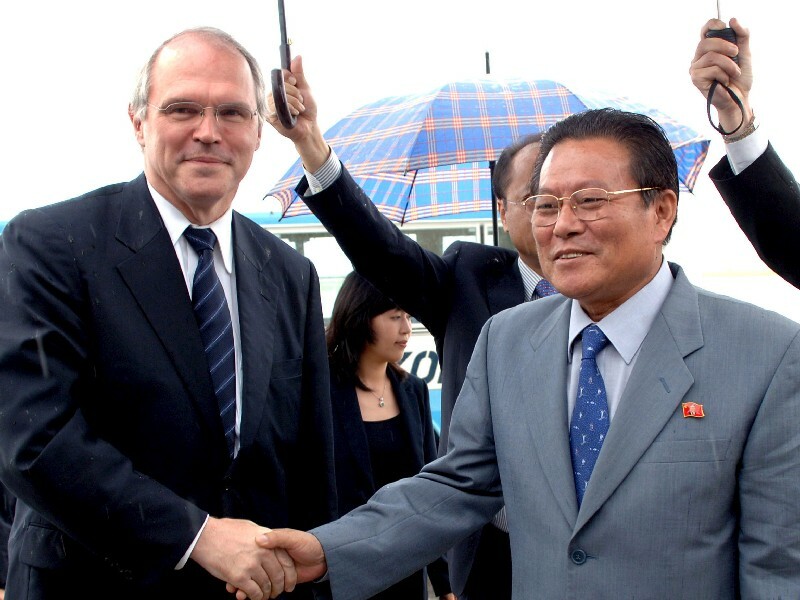 Had Ambassador King made his scheduled trip to Pyongyang, he would have been the highest level U.S. official to have visited the isolated nation since the young leader, Kim Jong Un, took power in December 2011. Rodman “promised” Thursday that he would raise the issue with Kim Jong Un at a scheduled meeting at the invitation of “my friend” Kim Jong Un, the 29 year old basketball fanatic who leads North Korea and its nuclear weaponized fourth largest standing army in the world. “I will definitely ask for Kenneth Bae’s release,” Rodman told Huffington’s Live host Marc Lamont Hill. NBA bad boy Dennis Rodman’s circus troupe delegation to North Korea was greeted by ridicule by most of the world. But does the Kim dynasty’s longtime basketball obsession hold the seed that will open North Korea to the world? U.S. diplomatic insiders were dismissive of the Rodman meeting last week, describing it as “goofball diplomacy”. But basketball has played a very real role in the often bizarre, you-can’t-make-this-stuff-up backroom antics of U.S.-Pyongyang diplomatic negotiations for 25 years. A love of the game shared by Kim Jong Il and his successor, current North Korean dictator Kim Jong Un, has on occasion put basketball on the same bench as nuclear warfare in top level talks between the U.S. and the Democratic People’s Republic of Korea. Rodman’s visit is just the latest wacky chapter in a diplomatic story that has seen the hoop dreams of Kim Jong Il become an unlikely pawn in nuclear negotiations with the U.S. In 1991, at a low point of relations between North Korea and the United States, Washington invited three North Koreans to a conference at George Washington University about peace on the Korean peninsula. At the time, the U.S. had no diplomatic relations with the DPRK, so the delegation from Pyongyang was attending in an “unofficial” capacity. Ri Gun “then moved to the TV, turned it on and stared transfixed at the opening jump ball of the NBA basketball between the Chicago Bulls and the Cleveland Cavaliers,” Schmiel recalled in an interview this week. “Ri Gun headed the delegation and talked about an interest in basketball and Michael Jordan…Scotty Pippen this and Michael Jordan that, the triangle defense this, three points shots. They cared more about the NBA than I did”. “We spent the rest of our time together that evening debating not high policy, but high quality basketball shooting and such arcana as whether the NBA should permit use of the zone defense. It was clear from our discussions that he had watched the NBA for many years. They cared more about the NBA than I did”, Schmiel added.